Could this child be helped by an 'Early Help' response? Can I identify other professionals to contribute to an Early Help plan? PLEASE CONSIDER THE FOLLOWING BEFORE CONTACTING THE HUB. 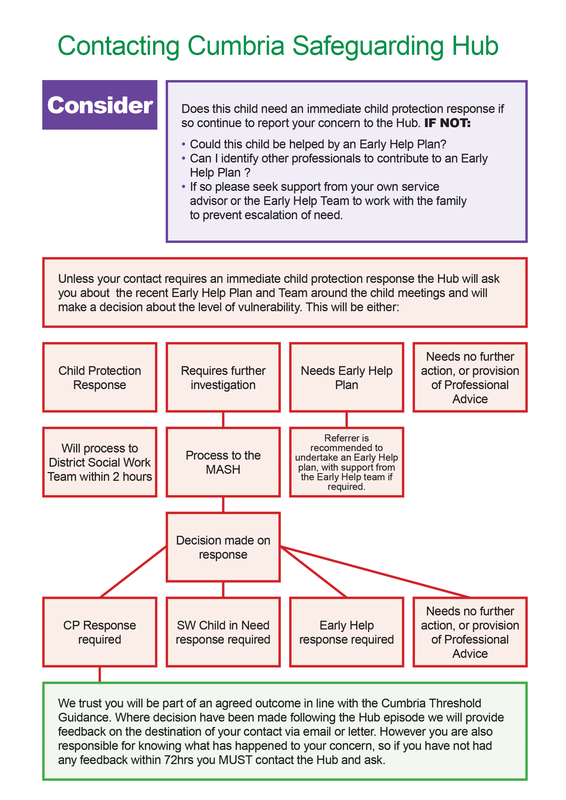 PLEASE CLICK HERE - THIS EXTERNAL LINK WILL OPEN IN A NEW WINDOW TO VIEW CONTACTING CUMBRIA SAFEGUARDING HUB FLOWCHART. Please ensure you have all relevant details to hand before you start to complete the form and also note that the form will time out after one hour of inactivity and any information will be lost. Please refer to the Multi-Agency Thresholds Guidance to be clear about the thresholds for access to services which support the actions needed to improve the outcomes for children. Please read the thresholds guidance before making a contact to the Hub. Have you considered Early Help? Early Help is the response made when a professional identifies needs with a child/family and works with another agency or agencies to meet those needs. 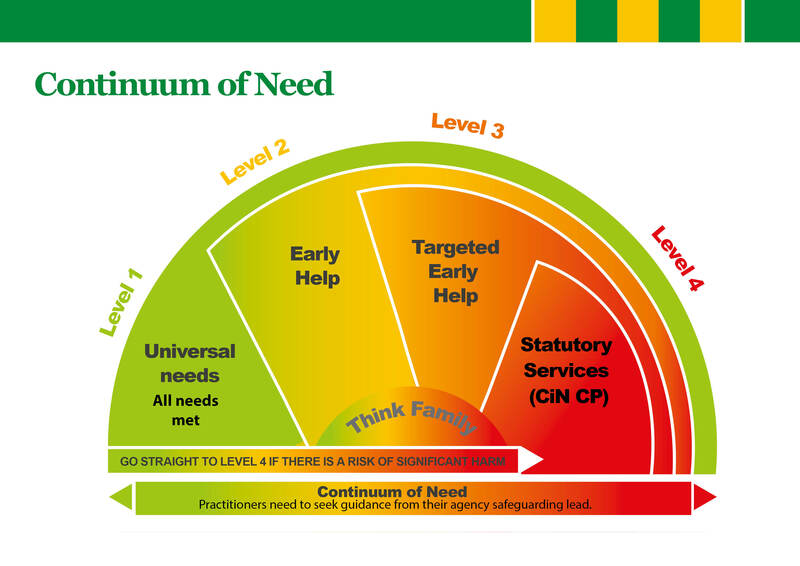 At this level of need an Early Help Assessment (EHA) should be completed with the child and family to identify needs and agreed desired outcomes. A good assessment of needs and the establishment of achievable and measurable outcomes is an essential element of effective early help. Any worker from a service that supports families can initiate this process. For Risk Assessment toolkits please see the relevant Safeguarding Practice Guidance in the LSCB Online Procedures Manual . What to do if you have a serious concern about a child or young person when the children’s services offices are closed? (i.e Weekends, Bank Holidays, and between 5pm [4.30pm on Fridays] and 8am during the week). If you believe them to be at risk of immediate danger dial 999 and speak to the Police. If you believe there is a safeguarding concern which requires a social work response out of hours call the Emergency Duty Team (EDT) on 0333 240 1727. If the duty worker is already responding to a call there is a message facility allowing the caller to invite a call back by leaving their details and a brief summary of their concern. During busy periods, calls will sometimes have to be prioritised according to needs and council thresholds. The EDT is a small team of social workers who work shifts; this means that there are only one or two social workers on call to cover the entire county. We are therefore only able to respond to Emergency situations which cannot wait until the next working day.